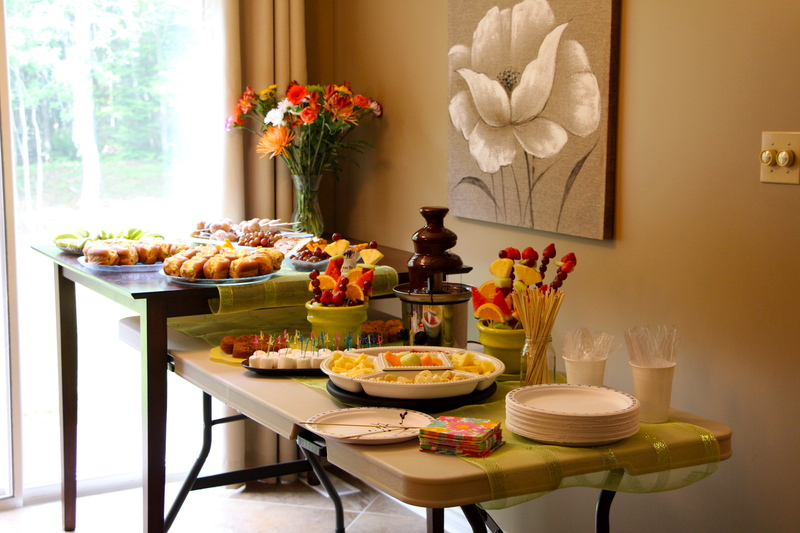 I recently hosted a baby shower for my sister-in-law and my newest niece, Rayna! Since she was already born and 6 weeks old, it was so nice for people to come and hang out with her. It also allowed us to be creative with the theme! We really played up the ‘April Showers brings May Flowers’ theme, which I thought worked perfectly! 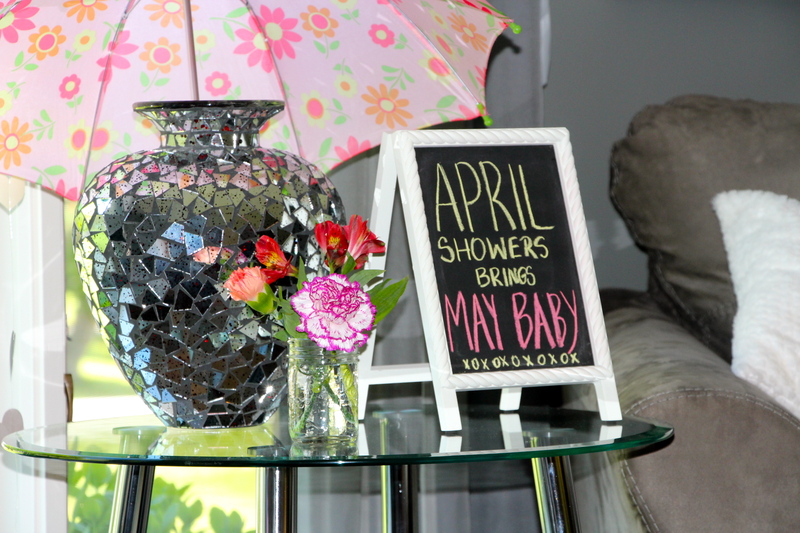 (name being Rayna and was born in May) Raindrops, umbrellas, and fresh flowers were the main source of decor, with some other fun details too! Check out the pictures below, and get inspired for your next baby shower! 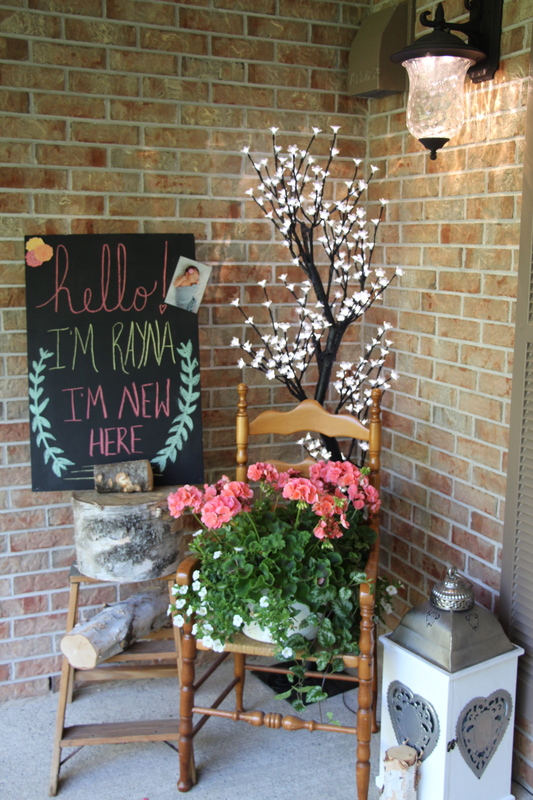 The guests were welcomed by a pretty front door display! Super easy to do, all you need is an old chair, a pot of your favorite flowers, some wood pieces and a few other odds and ends you can find around your house. The sign was inspired from a recent baby announcement I got in the mail from my cousin! 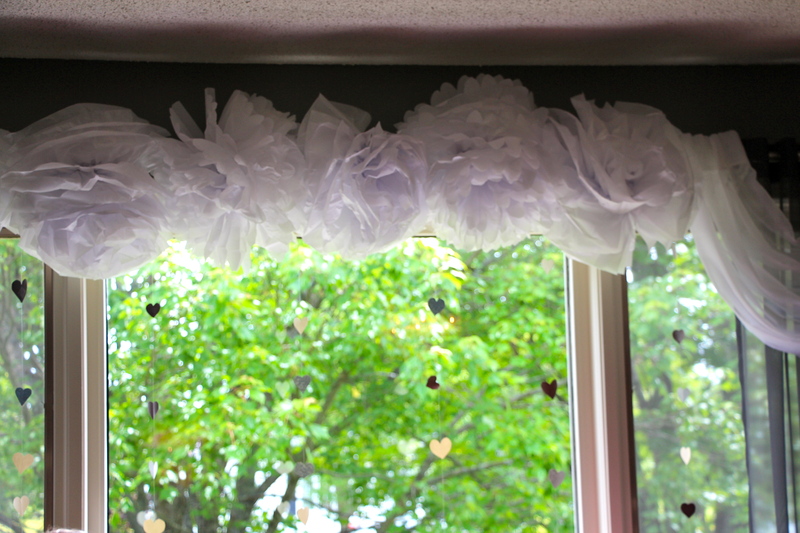 You can check out her Facebook page Frosted & Fabulous for more inspiration! The best part about this display is that once the shower was over, all I had to do was remove the chalk board and I am left with a cute front door display for the rest of the summer! Since it was a brunch, we kept it pretty simple on the food and drinks! The drink station was easy to put together as well. 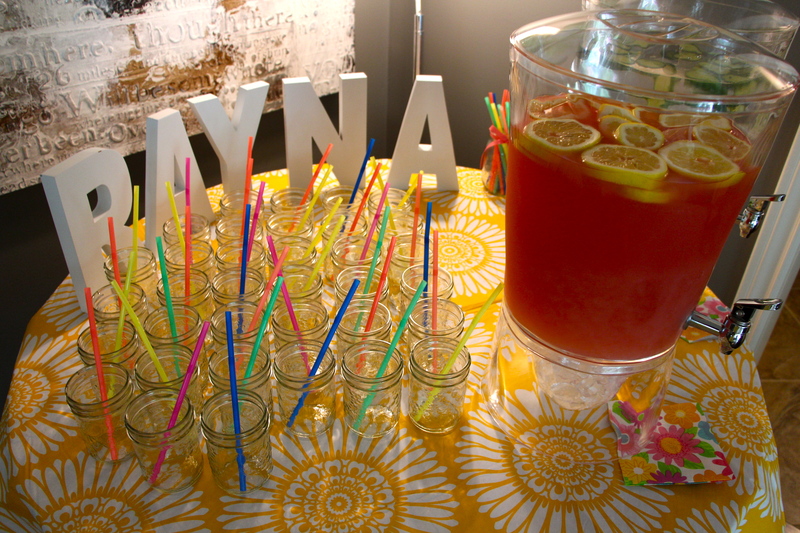 A bright table cloth, wooden letters, small mason jars and some fresh drinks to add colour! Our food was buffet style with fresh fruits, chocolate fondue, small pastries and finger rolls. I especially loved the fruit kabobs my other sister-in-law made and displayed in cute flower pots! 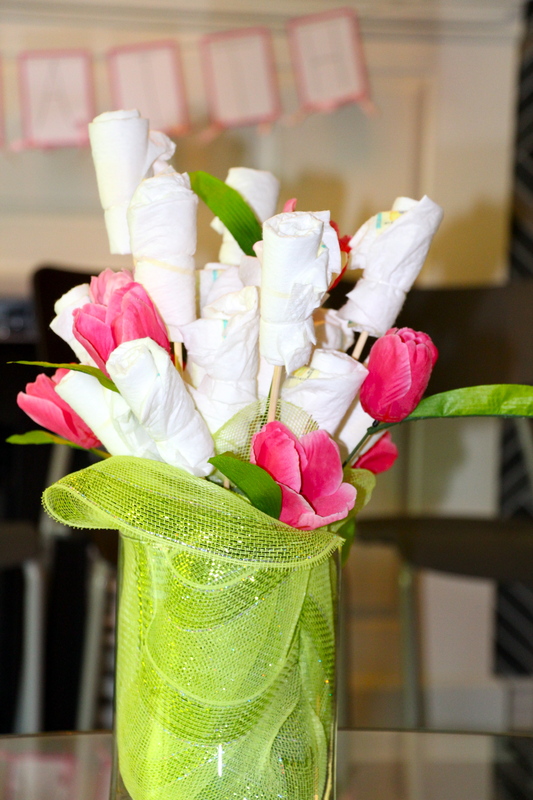 How adorable is this diaper bouquet? Hard to believe I made it under 10 minutes! These favors were done up the night before! 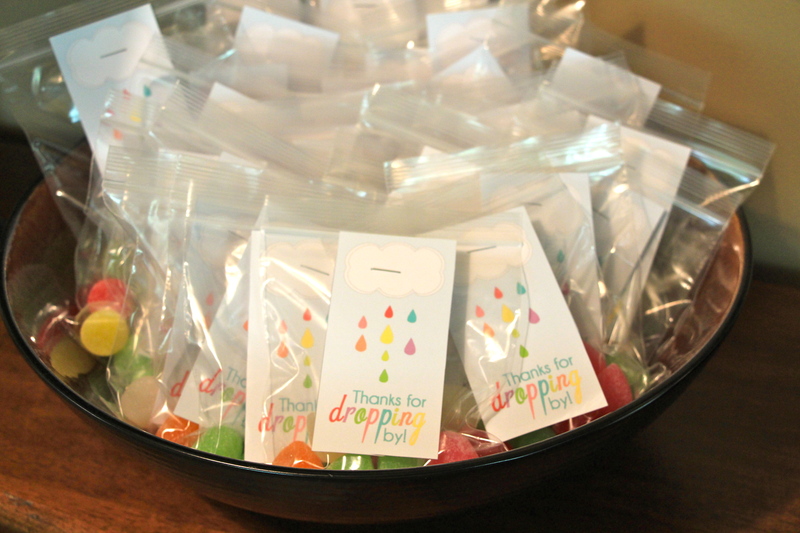 I found a free printable online, stapled them to clear baggies and added some gum drops! Cute way to send your guests out the door! There are so many ways to add personality to baby showers! Hope you found some inspiration for the next shower you might host! Thanks for reading!